a. 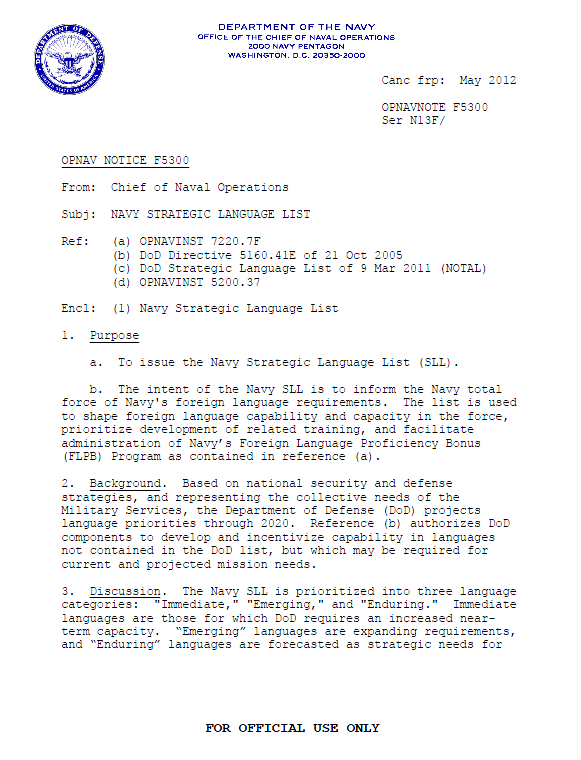 To issue the Navy Strategic Language List (SLL). b. The intent of the Navy SLL is to inform the Navy total force of Navy’s foreign language requirements. The list is used to shape foreign language capability and capacity in the force, prioritize development of related training, and facilitate administration of Navy’s Foreign Language Proficiency Bonus (FLPB) Program as contained in reference (a). 2. Background. Based on national security and defense strategies, and representing the collective needs of the Military Services, the Department of Defense (DoD) projects language priorities through 2020. Reference (b) authorizes DoD components to develop and incentivize capability in languages not contained in the DoD list, but which may be required for current and projected mission needs. 1 Navy considers these African dialects and languages one language group. 2 Navy considers these Arabic dialects and languages one language group. 3 PIF language – Paragraph 4 of this notice pertains. 4 Navy considers these Chinese dialects and languages one language group. 5 Navy considers these Philippine Island dialects and languages one language group. 6 Navy considers these Vietnamese dialects and languages one language group.